As always it’s a busy time in Harvard Yard. Tourists travel worldwide to see the infamous John Harvard statue, students study between classes in preparation for midterms, and photographers take pictures of the beautiful landscape and buildings at Harvard. But, mostly unnoticed, the busiest of all is the scampering squirrel who is gathering acorns and food for the upcoming winter. Especially now that winter looms and the bright colored chairs in Harvard Yard have been removed, the squirrel is even more noticeable as he stocks up on his impending feast for the next several months. The gluten free Hershey Kiss Acorn Treat is made in honor of the squirrel, in hopes that this winter, unlike the last, will be short and that the squirrel will have plenty of food to keep him satisfied. 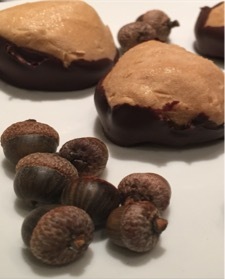 This recipe is very simple, but it is the perfect one-bite party snack that has an incredible chocolate peanut butter flavor. Place mini vanilla wafers on a tray with the flat side of the cookie toward the top. 2. Squeeze a small amount of icing onto the bottom of an unwrapped Hershey Kiss and place it onto the center of the cookie. Let sit for a few minutes to allow the icing to harden. 3. Place a small amount of icing onto the bottom of a Reese’s Piece and place onto center and top of the cookie. This amazing acorn treat is a simple and tasty way to honor the squirrel and enjoy a great gluten free bite at the same time. In an effort to test how yummy Buzzfeed suggestions really are, I spent my Friday afternoon making these pumpkin muffins! Spoiler alert: never shall I doubt Buzzfeed again. Pumpkin is always a tricky ingredient – it has an interesting consistency and tends to overpower everything else in the dish. A basic rule of thumb for cooking with pumpkin is to enhance the flavor with the correct spice, but to make sure to incorporate more dynamic elements into the recipe so that pumpkin isn’t the only flavor. This is why I added chocolate chips to these muffins. Chocolate and pumpkin is actually an underrated combination, plus they look amazing together! The recipe also calls for pumpkin spice, which is just a combination of basic fall flavors: cinnamon, nutmeg, clove, and ginger. Since I’m a normal college student, I didn’t just have those lying around so I was very generous with cinnamon and vanilla extract. It still tasted great! The big takeaway from this is that recipes aren’t set in stone. As long as you have the basic chemistry down, you can take liberties to personalize and experiment with the dishes you create. After all, you’re the one eating them so it’s really up to you. Above all else, don’t be scared to try new recipes and ingredients. I’m basically inept – there was a period of time in high school when I was banned from using the microwave due to an unfortunate aluminum foil incident – but I was committed to making myself something nice and pumpkin-y and, I’m not going to lie, I crushed it. 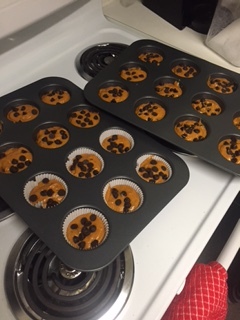 It’s helpful to remember that if you don’t make yourself chocolate chip and pumpkin muffins, then you won’t be able to eat chocolate chip and pumpkin muffins. With that inspiration, go forth! And happy fall from Crimson Crave. Preheat oven to 350 °F. Line 24 muffin cups with paper or silicone liners and coat with nonstick cooking spray. In a medium bowl, sift together flour, baking powder, baking soda, cinnamon, pumpkin spice, and salt. Set aside. In an electric mixer fitted with the paddle attachment, or in a large bowl with a whisk, combine eggs, sugar, oil, and pumpkin. Add the flour mixture in two batches, mixing after each addition until uniformly combined. Using a large cookie scoop, fill the muffin cups nearly to the top with batter. Bake about 25 minutes, rotating the muffin tins halfway through baking time, until a toothpick inserted in the middle of a muffin comes out clean with a few crumbs attached. Cool completely. While the muffins are cooling, in a large bowl, combine cream cheese, butter, powdered sugar, and vanilla extract until smooth. Frost muffins using a spatula or a pastry bag and piping tip of your choice. Top with pumpkin candies.